Three of the seven games were postponed, no surprise given the weather conditions over the weekend and certainly not surprising that Carlisle's home game was one of them called off. The game between the top two did go ahead though with Bury winning 3-2 at Walsall. That was a result that took them back past their opponents to the top of the league with Wigan also moving ahead of the Saddlers after a win against Preston. As it stands, Bury lead the table by one point from Wigan who are themselves a point ahead of Walsall, but Bury have no game this weekend with Wigan playing hosts to Walsall. A Wigan win or a draw at Robin Park will take them to the top and a Walsall win will be enough to take them back up two places to first. In the other two games played on Saturday, Port Vale beat Blackpool 1-0 while Burnley suffered a heavy 6-1 defeat at Wrexham but the Burnley team was unrecognisable with only four scholars, and those all first years, involved. Those scholars were Olatunde Bayode, Miles Fenton (pictures), Billy Grogan and Mark Howarth. All four played just half of the game. The rest of the team was made up of schoolboys and an under-16 trialist. Our team was: Adam Bruce, Leighton Egan, Oliver Younger, James Clarke, Scott Wilson, Olatunde Bayode, Miles Fenton, Mark Howarth, Dwight McNeil, Richard Atta, Callum Styles. Subs: Marcel Wusiewicz, Aiden Hopkins, Billy Grogan, McDonough (trialist). 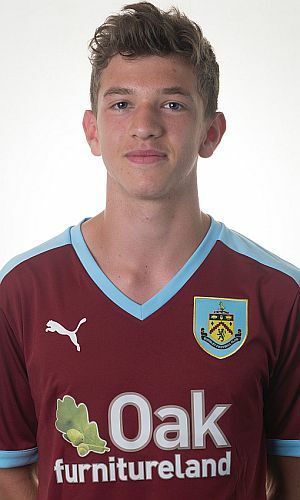 McNeil was the Burnley scorer. We are back in action this Saturday with a home game against Port Vale who are a side in the middle of the table. Last week's results, this week's fixtures, our goalscorers and the current table are all below.